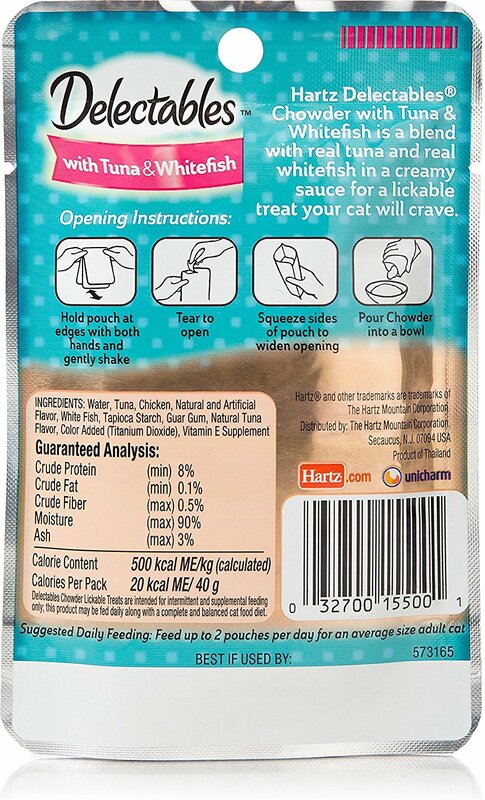 Give your cat a new way to snack with the Hartz Delectables Chowder Tuna & Whitefish Lickable Cat Treat. Because he’s extra special, you need an extra special way to give him a reward. Simply open the pouch, pour into his bowl, and let him enjoy the tender pieces of goodness. Moist and delicious, it makes the perfect snack for in between meals. 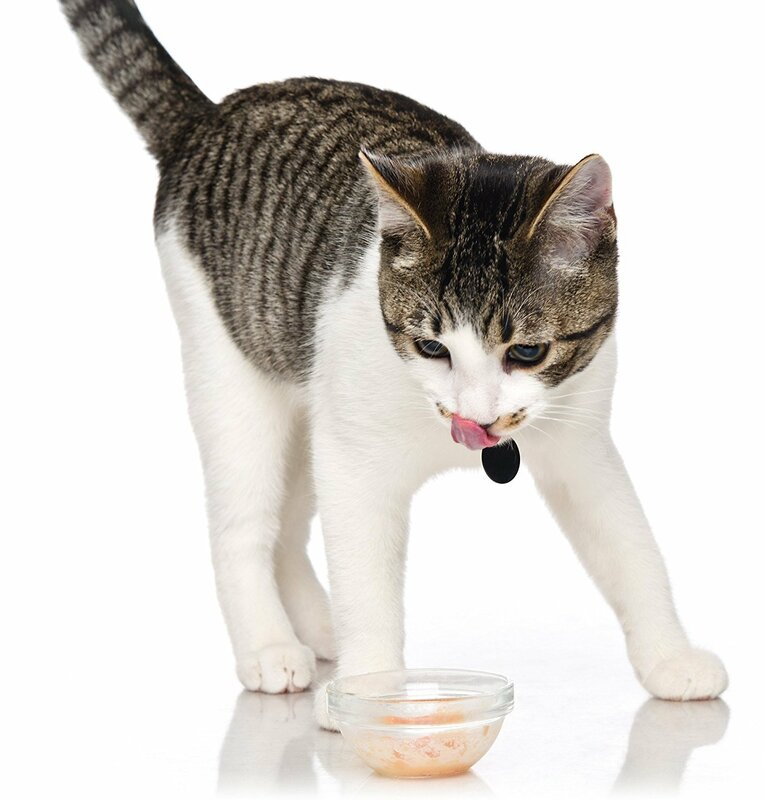 It’s also a great topper for dry food, with real meat and a creamy sauce that easily mixes in and entices him to gobble up every last bite. Any way you serve it, this lickable treat will leave him licking his chops! Lickable treat made with real meat gives cats a new and delicious way to snack. Blend of tender pieces of real tuna and real whitefish in a delectable creamy sauce. Just open the pouch and pour into his bowl for a snack in between meals. Also great as a food topper to entice cats to eat their kibble. Mess-free pouch offers an easy and fast way to serve up the palatable flavor. Water, Tuna, Chicken, Natural & Artifical Flavor, White Fish, Tapioca Starch, Guar Gum, Natural Tuna Flavor, Color Added (Titanium Dioxide), Vitamin E Supplement. Feed up to 2 pouches per day for an average size Adult cat. It's a hit. My finicky feline loves to lap but is not fond of big chunks of solid food in the liquid. This chowder is perfect for her because it's very smooth and creamy. It's a bit on the thick side, so I add just a few drops of water before serving. She doesn't leave so much as a speck in the bowl. And I like the fact that this product contains nutritional ash. I thought I would try this product for my cat and she wouldn't touch it. So I gave it to my sister in law. She has 6 cats and they eat anything. They didn't go to waste. I purchased this for my boy, not sure if he' would like it. I usually buy a broth in another brand. Well he loves it. I'll be buying this again. I obtained & trained in indoor-outdoor cat in more rural Boston area. There are definitely serious predators in my area (such as fisher-cats). For his safety & have trained & continue to support his coming in & cat door shut just after dark (before prime time of middle-night & pre-dawn hunters). He has become pickier for that "gravy treat" (otherwise he just licked off the canned treat food). He loves this!!! It is important for his safety & this is efficient & easy to use. 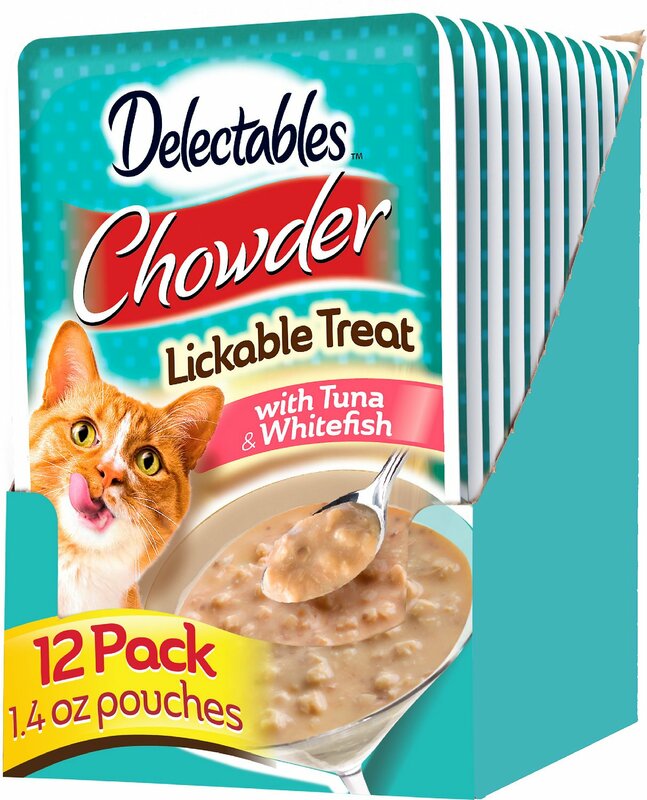 Here is another item for the cat's with a lot of "GRAVY" being this is all they will eat these days. In the past they would just lick as much of the gravy off, of whatever I gave them and leave the pieces of food until the next feeding. NOW... they lick the plate/bowls clean! Great find and thank you Hartz! I tried this when it was on sale at the grocer. 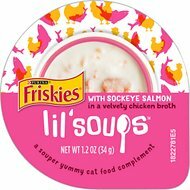 I have a 14 1/2 year old cat and I'm caring for a 13 1/2 year old cat who does not eat solids. He licks all the gravy. This stuff is amazing. I feel he is getting some "solids" because it is all pureed! Both my indoor/outdoor cats are so finicky. They loved the lickable Tuna and Whitefish Chowder. Not much fish in it but the sauce was licked up immediately. Since this is NOT a main dish and more of a treat, I would reccomend it. 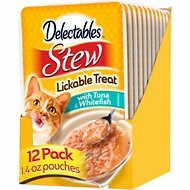 These R The ONLY Thing My Cat will Eat! I have the pickest cat EVER! After about a MONTH of trying EVERYTHING available. 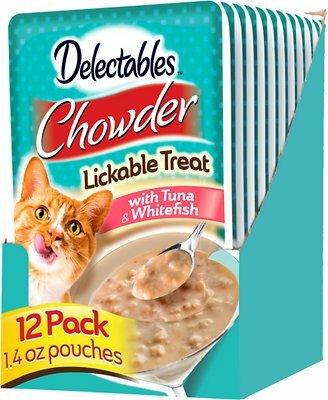 She will ONLY EAT the Delectibles Tuna flavors. She wants the creamy texture of baby food. Oh, she WILL also eat baby food in turkey only, Delectbles are her by far her favorite I wish they would make pouches that have at least twice the amount. I'm having trouble affording this. Shes been going through 5 pouches a day. $$$$$ Yeouch!